An economically empowered family positively impacts the lives of children especially young girls. In line with this statement Child Aid Zimbabwe through its first line of strengthening the economy of the family trains ,supports and empowers each family to increase its income through establishing income generating projects IGPs. Families in the Child Aid projects organize themselves into Village Action Groups, that become the core of driving their IGPs that include nutrition gardens ,beekeeping, piggery, poultry, second hand clothing, sewing clubs and food outlets among other projects. Each Action Group consists of 30‐40 families who are organised together and meet every week for lessons and actions. In the first half of 2018 Child Aid Zimbabwe achieved its aim of transforming families’ livelihoods so that they can be self-sufficient. The VAGs supported the revival of 33 group gardens soon after the rain season. 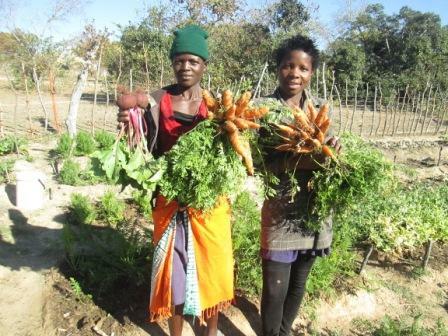 A total of 3550 families were trained in thee importance of having nutrition gardens for dietary diversity. Families responded positively and revived their household gardens and made sure that they had a minimum of 5 crop varieties.The gardens have become source of income for families, such that they are able to meet their basic needs. So far Eighteen income-generating projects in agriculture, aquaculture, indigenous chicken, rabbits and horticulture were established with much training support from AGRITEX. The 3550 families from Rushinga, Bindura and Shamva districts were food secure. Child Aid conducted 50 lessons on improving income and established 40 internal saving and lending clubs which are localized financial systems. Money from savings clubs have been used by families to engage in various income generating projects such as poultry and piggery. As a result of the income generating activities and ISALs, improved the financial positions of the families making it easy to pay school fees and caring for their families. Youth unemployment remains a challenge in Sub Saharan Africa and is regarded as a key driver of poverty. In Zimbabwe it the number of unemployed youths continues to grow due to a myriad of economic challenges that has seen industries and companies closing. The fight against poverty remains at the heart of DAPP Zimbabwe programming. Through vocational training at Ponesai Vanhu Technical College youths are equipped with the necessary knowledge and practical skills necessary for them to earn a decent living and be a part of stimulating economic growth. PVTC vocational training is well known for developing occupational competencies in the flagship courses in Motor Mechanics Business studies and brick and block laying. The college also offers three months short courses in Brick and Block Laying, Catering, Garment Making and Beauty Therapy in response to the current economic changes that do make access to training difficult for many. 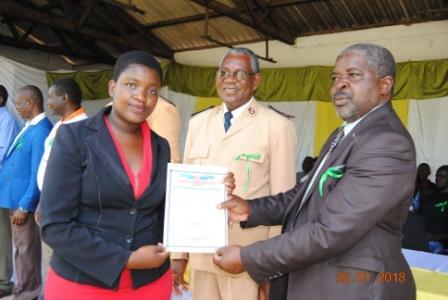 Ponesai Vanhu Technical college lives up to its name “Ponesai Vanhu” (Help People ) in ensuring that young Zimbabweans create sustainable self employment opportunities to overcome poverty and become contributors to the country’s economy. Due to its focus on careers based training for enterprise (TFE), Ponesai Vanhu Technical College equips individuals with innovative skills which are current which enable them to set up their own businesses. Ponesai Vanhu Technical college remains non-discriminatory in that it promotes quality vocational training for young women and girls. This is in line with the country’s gender equality drives to see equal access to opportunities. We are being seen participating and thriving in traditionally male dominated fields such as motor mechanics. As we commemorate the International Day for the Eradication of Poverty, DAPP Zimbabwe calls on young people to not wait around for government to create jobs but to enroll in vocational institutions such as PVJS to liberate themselves from the effects of poverty.